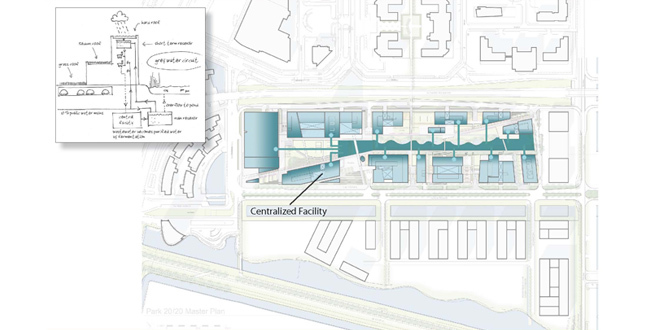 Park 20/20 advances a new model of sustainable urbanism by incorporating Cradle to Cradle design philosophy and integrated site systems concepts at the earliest stages of planning mixed-use transit-oriented development in the Schiphol International Airport development zone. Historic Context Dutch Polder Landscape. 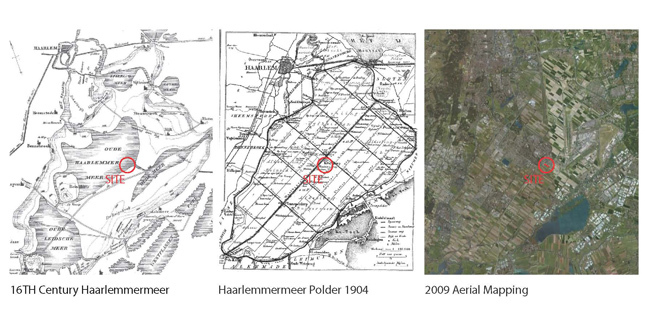 The site is located in a polder (land reclaimed from sea) with distinct grain of preindustrial era parcelization. This iconic man-made environment is revered as Netherlands' "cultural landscape" yet modern-day polders are challenged by limited biodiversity and rising sea level. Planning Context Beukenhorst Zuid Master Plan. 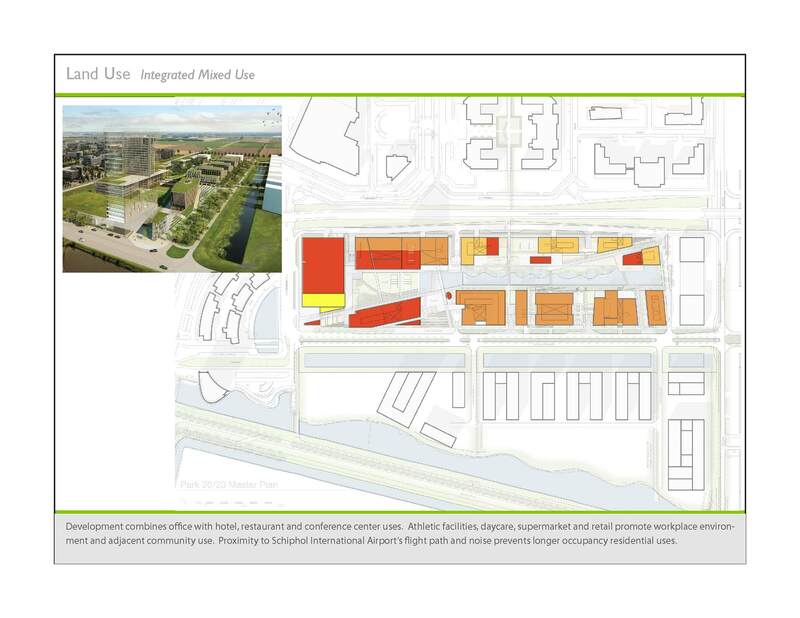 Park 20/20 integrates the regional "polder grammatical" of orthogonal roads, vegetation, and canals within a larger development area than typical (narrow lot and rational parcelization) to create an economic case for district-scaled infrastructure and other sustainable design strategies. Site Analysis Ecological Integration and Connectivity. In agricultural use for centuries, the site has limited vegetation, habitat or biodiversity. 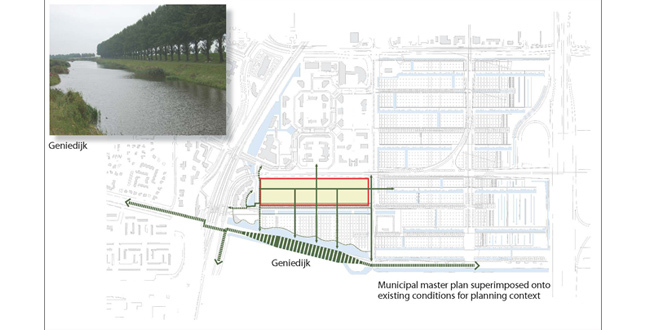 The master plan reconnects the site—and the adjacent community—to a more ecologically robust and diverse regional network of parks, greenways, canals and remnant wetlands. Site Analysis Mobility and Access. The site is adjacent to existing high-capacity bus and rail stops. 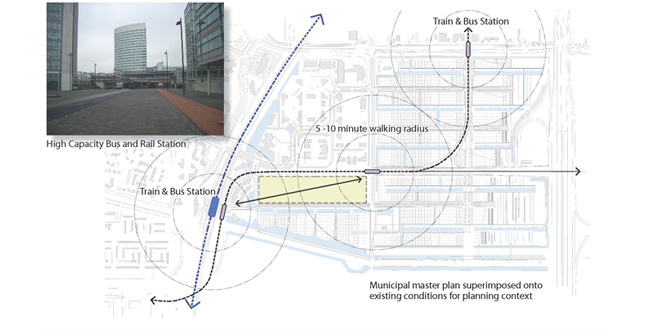 To promote transit use, pedestrian circulation provides access to stations east and west of the site. The massing and open-space plan reinforces the connection. Site Analysis Solar Path Diagram. 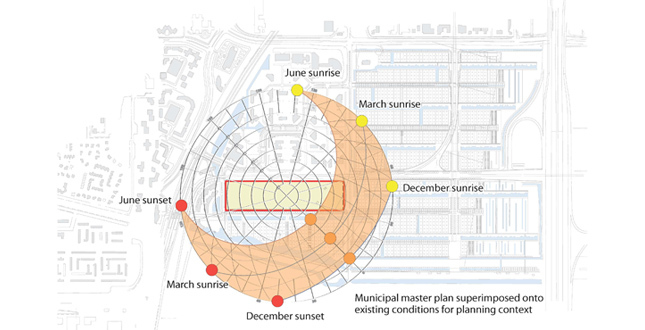 Diagramming the sun’s path throughout the day and year identifies the optimum building orientation (15º northeast of east) in Netherland’s northern latitude to reduce energy demands by minimizing solar gains in the summer and optimizing solar access in winter. Annual and Hourly Shading Studies. Optimized solar access is important in a climate with low sun-angles and short days throughout the winter. 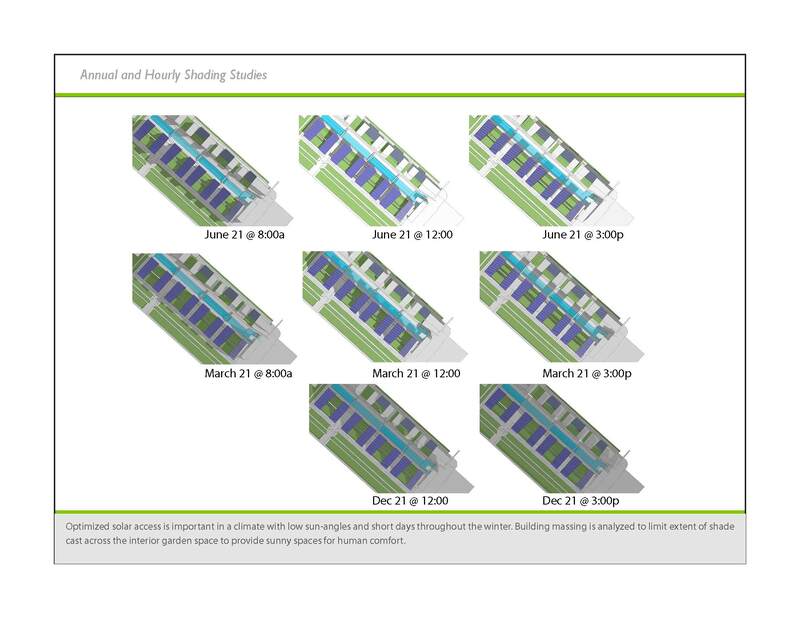 Building massing is analyzed to limited extent of shade cast across the interior garden space to provide sunny spaces for human comfort. Site Analysis Wind and Ventilation. Building orientation helps to capture prevailing breezes for site and building ventilation, a passive energy demand reduction strategy. Landscape is used to buffer the site from strong winter winds. Land Use Integrated Mixed Use. Development combines office with hotel, restaurant and conference center uses. Athletic facilities, daycare, supermarket and retail promote workplace environment and adjacent community use. 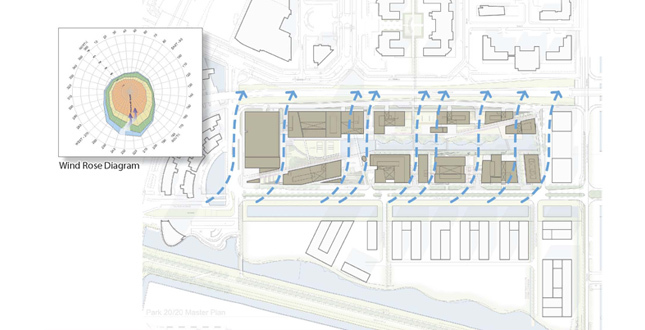 Proximity to Schiphol International Airport’s flight path and noise prevents longer occupancy residential uses. Integrated Systems Waste, Heat & Power. Office wastewater and restaurant green wastes are treated in a solar aquatic waste-treatment system within a centralized facility on site. Biogas from the wastewater treatment powers the turbines for electricity. Heat generated in the process produces hot water for the hotel. Integrated Systems Stormwater and Wastewater. 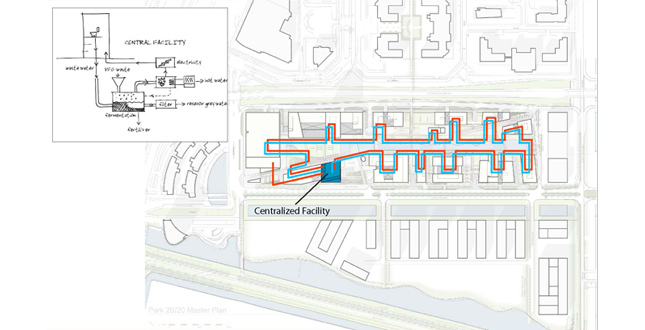 Wastewater is collected through a district loop for an on-site treatment in the central facility. After purification, greywater is reused for toilet flushing. Green roofs absorb rainfall. Runoff and overflow are directed to on-site storage. Integrated Systems Photovoltaics and Photosynthesis. 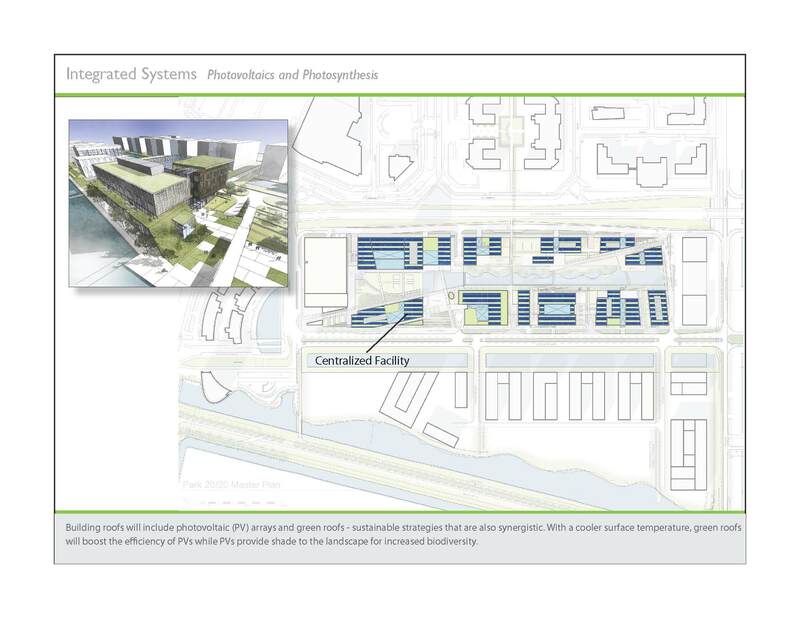 Building roofs will include photovoltaic (PV) arrays and green roofs—Sustainable strategies that are also synergistic. With a cooler surface temperature, green roofs will boost the efficiency of PVs while PVs provide shade to the landscape for increased biodiversity. Integrated Systems Ecology and Biodiversity. 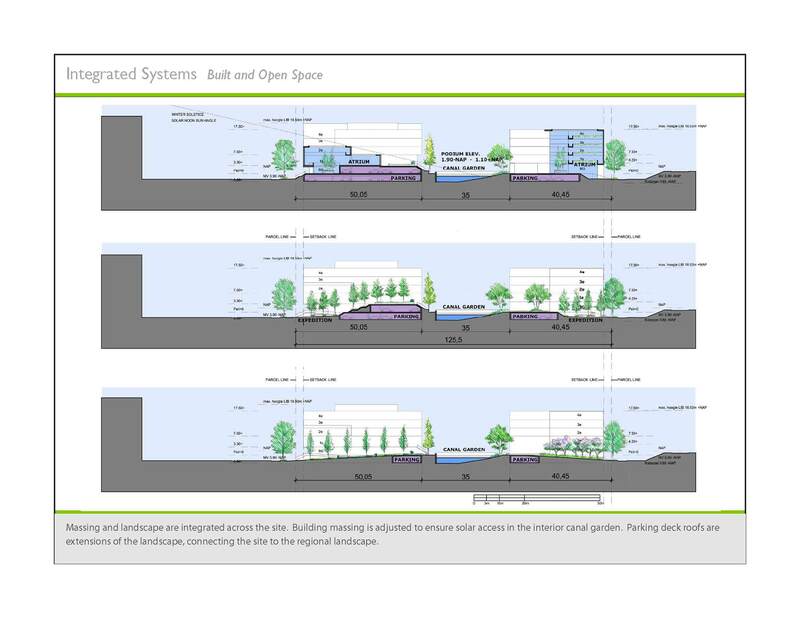 The landscape plan integrates the municipality’s rational and orthogonal streetscape and front yard standards with a more diverse and informal plant palette in the interior canal garden. Green roofs provide additional landscape and corridors connect the site to regional ecology. Integrated Systems Built and Open Space. 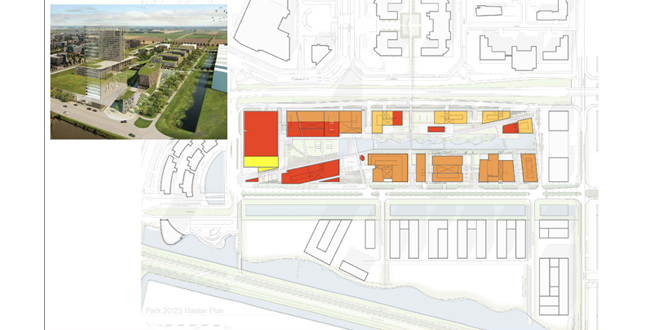 Massing and landscape are integrated across the site. Building massing is adjusted to ensure solar access in the interior canal garden. Parking deck roofs are extensions of the landscape, connecting the site to the regional landscape. 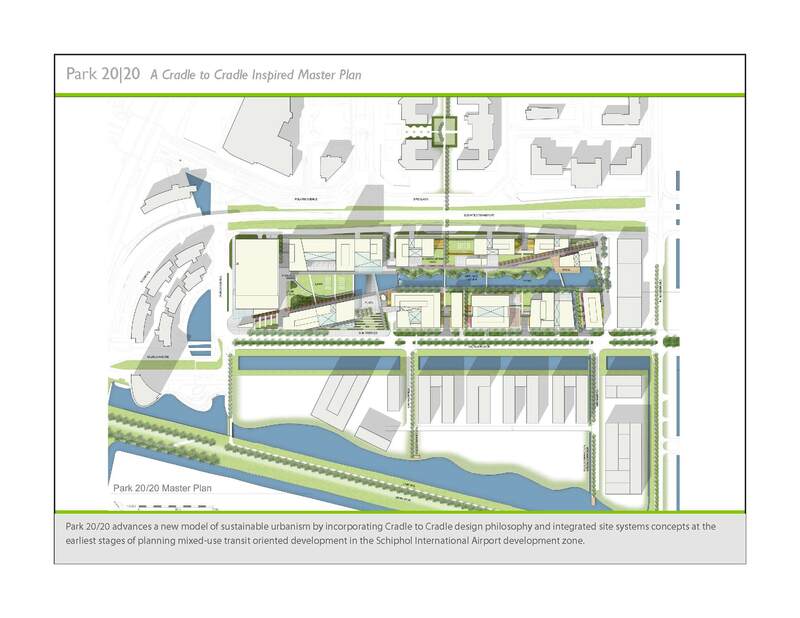 Park 20/20 A Cradle to Cradle Inspired Master Plan. 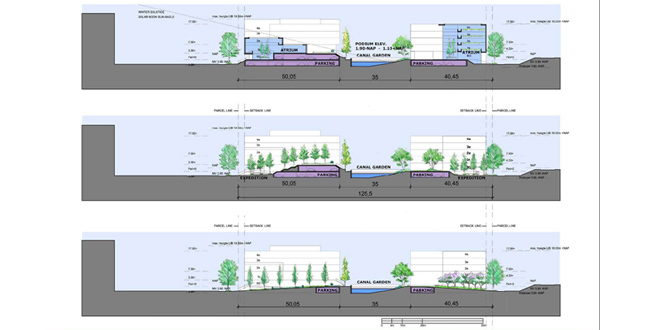 The landscape plan is respectful of the "cultural landscape" and the distinct planning template of the "polder grammatical" (narrow lots and orthogonal roads vegetation, and canals) by using the landscape standards in exterior planting and creating biosdiverse interior gardens. 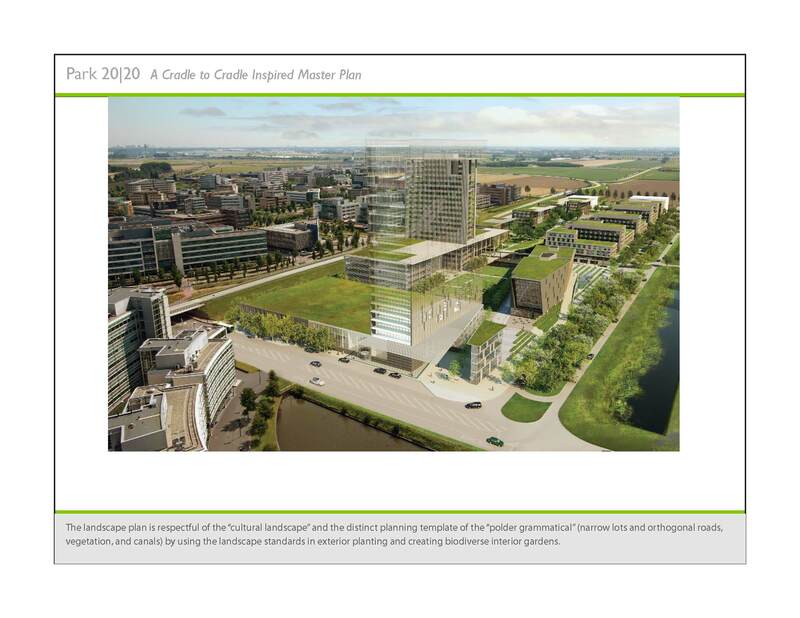 Park 20/20 is a new model of sustainable urban development located within a Dutch polder (land reclaimed from the seas). 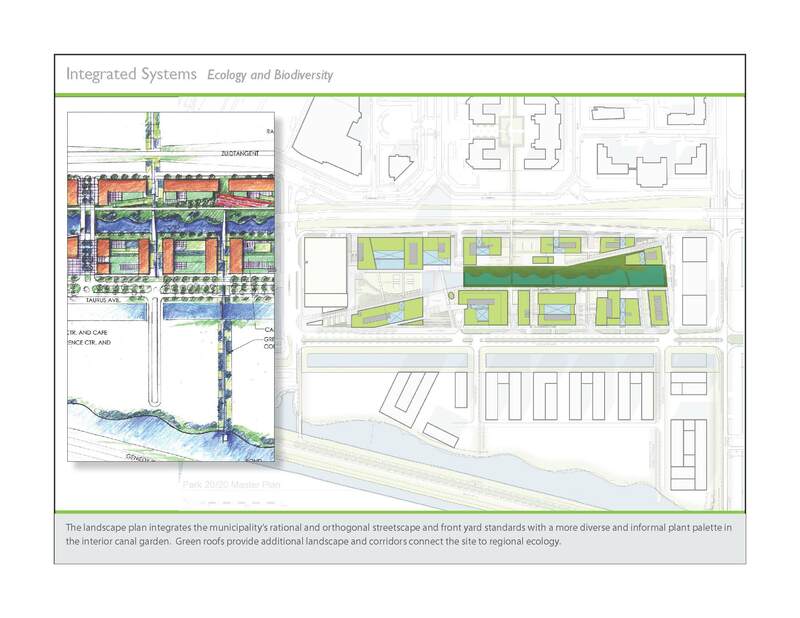 Planning concepts promote the regenerative design agenda of Cradle to Cradle philosophy at all scales, from regional ecological connectivity to on-site biodiversity and from workplace health and well-being to neighborhood connectivity. 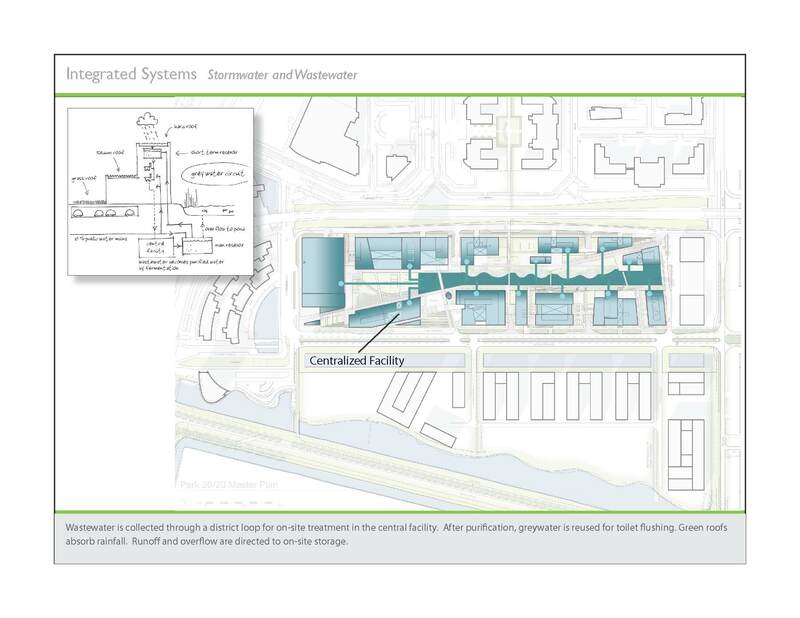 Integrated within the urban plan are highly effective district waste, energy and water system that eliminate wastefulness throughout the complex. 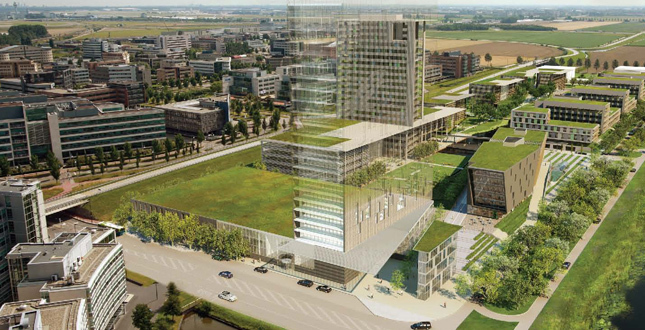 Park 20/20 is a new model of sustainable development, conceived as the first large-scale urban development in the Netherlands to implement the Cradle to Cradle (C2C) design philosophy. 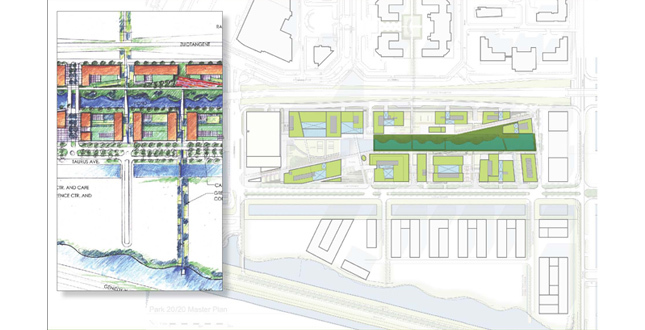 Located within a man-made "cultural landscape" of a Dutch polder (land reclaimed from the seas), the planning concepts promote regenerative design agenda of C2C philosophy at all scales, from regional ecological connectivity to enhanced landscape biodiversity, and from workplace health and well-being to neighborhood connectivity. 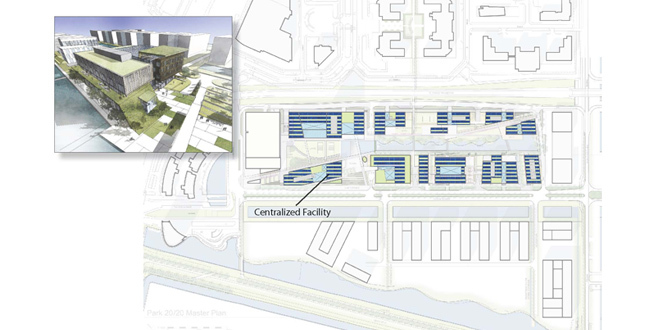 Integrated within the urban plan are highly effective district waste, energy and water system that eliminate wastefulness throughout the complex. 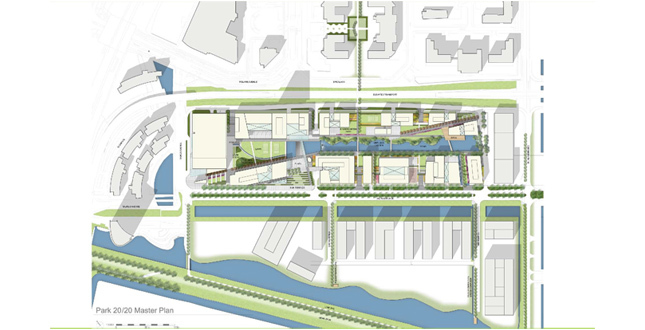 Economic—increase economic viability of area, attract and retain workforce, extend life cycle of the buildings, create marketplace distinction, and promote a development of viable size and density to allow integrated district-scaled infrastructure. 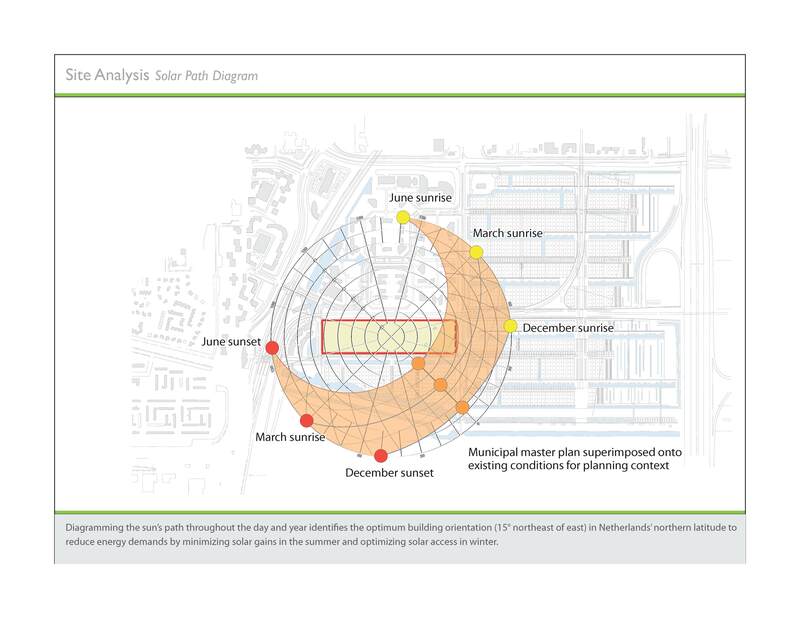 Solar path diagram—mapping path of the sun through the day and year to determine optimal solar orientation for passive energy strategies and to optimize solar access across site during the winter month. 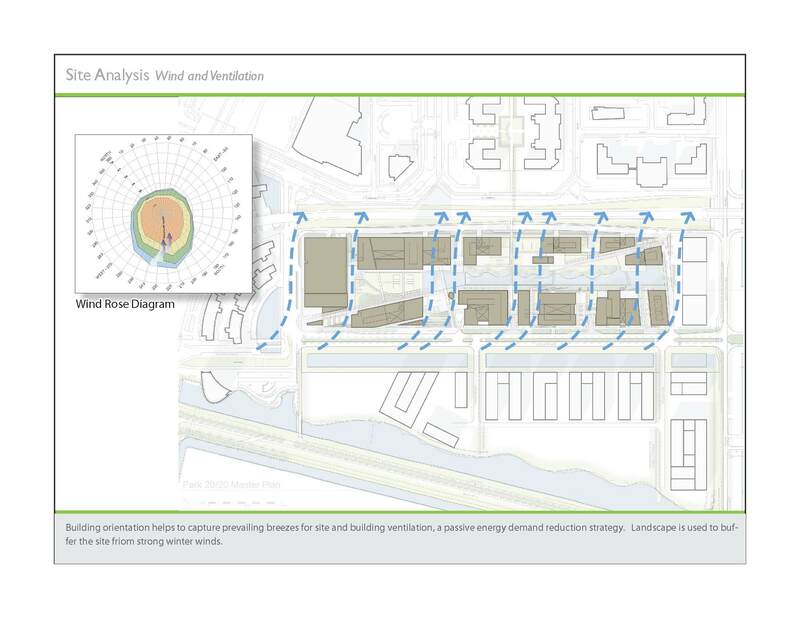 Wind rose diagram—to determine the prevailing breeze for site and building ventilation strategies and winter winds for protection strategies in winter. Local and regional ecological network—to optimize linkage of site landscape. 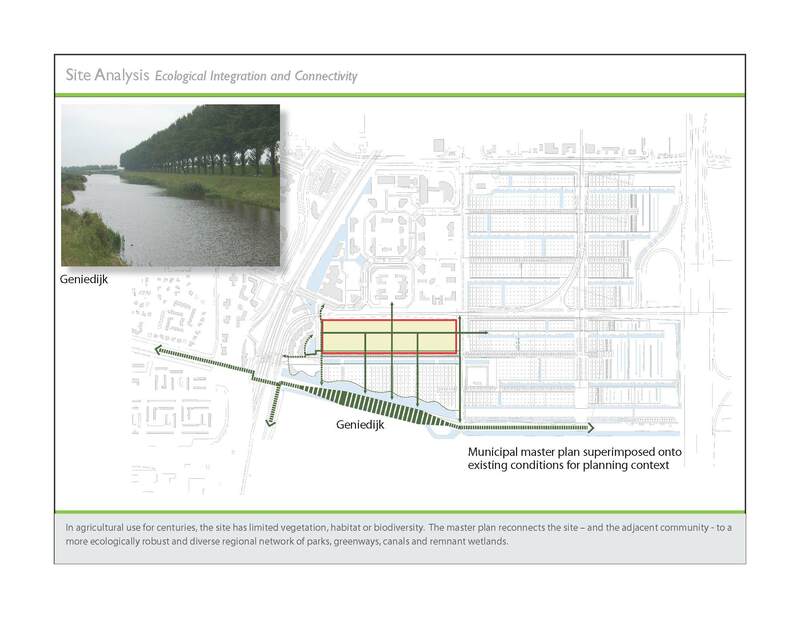 Polder water management—to understand site design impacts of unique Dutch canal system, flooding, water level stabilization, etc. Dutch environmental policy—highlighting lack of biodiversity as the most significant environmental threat followed by sea-level rise due to climate change. 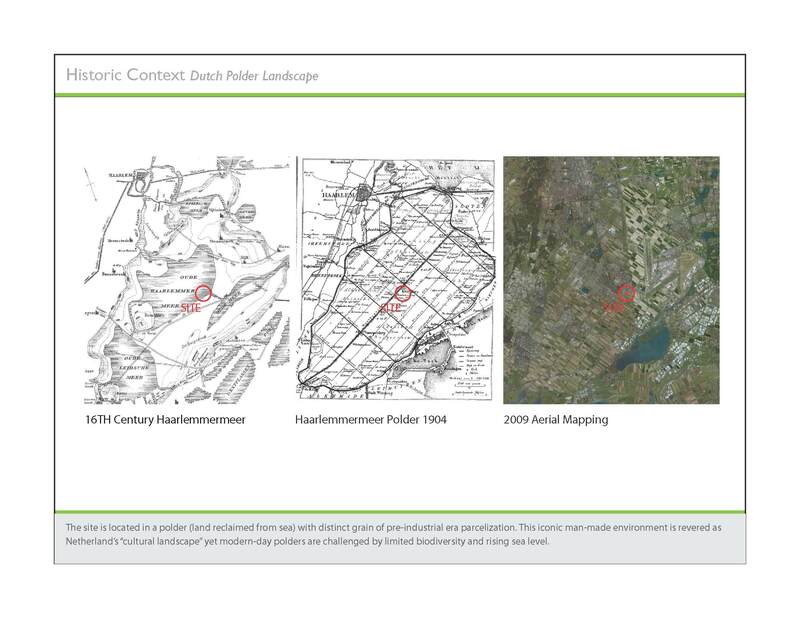 Historic and cultural context of the unique Dutch polder and cultural landscape—to understand application of the "polder grammatical" (elements of the landscape). Regional and local planning documents—to understand context and requirements. Character and land use of the adjacent community—to optimize connectivity. 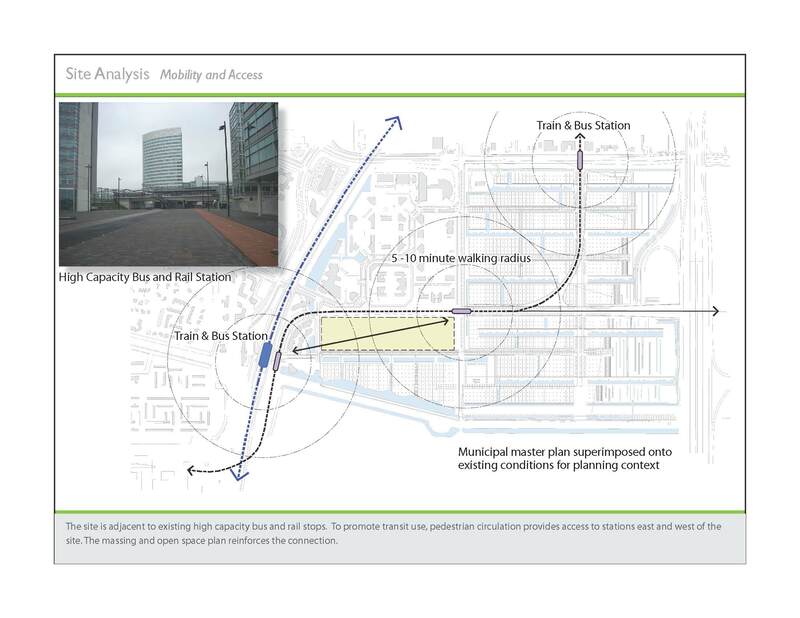 Mobility and access—to establish range of walkable distances to nearby transit stations. 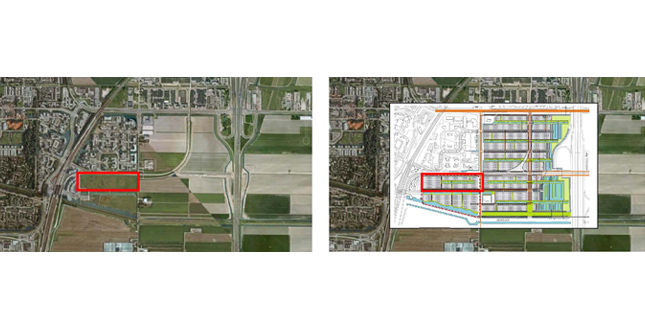 Proximity of Schiphol International Airport—for restrictions due to flight path and noise. New models for enhanced workplace environment—for development programming. 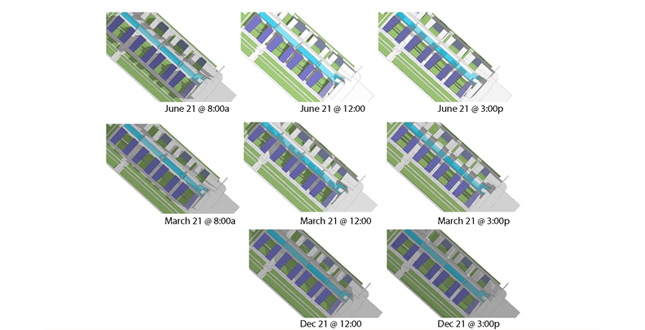 Integration of optimum solar and wind orientation (to reduce energy demand) for building within the context of the tight urban block and the development program requirements by adjusting the building massing to ensure solar access in winter. Integration of regenerative landscape strategies respectful of the "cultural landscape" and the distinct planning template of the "polder grammatical" (narrow lots and orthogonal roads, vegetation, and canals) by: introducing a more ecologically diverse plant palette, using the landscape standards in exterior planting and creating a more biologically robust interior gardens, connecting the interior gardens to regional ecology with landscape corridors, creating additional landscape area on roofs surfaces and parking decks. 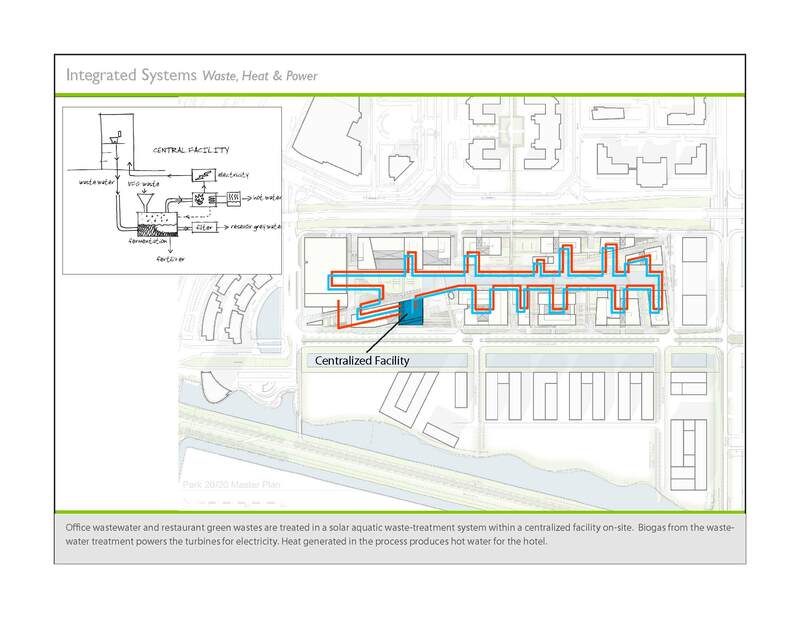 Implementation of effective district-scaled sustainable infrastructure approaches by aligning scale and types of land uses (i.e., hotel demand for hot water with office wastewater treatment output of biogas fuel for heating) and creating a centralized treatment facility for wastewater, energy and stormwater on site. Implementation of C2C agenda of waste-free design by treating wastewater on site, capturing energy and soil amendments, and eliminating sewage discharge. The master planning process involved consultation with municipality planners to ensure that Park 20/20 respected the regional and municipal master plans. Community interests were represented in the review and approval process, including policy and technical review by appropriate Aldermen and the City Council. 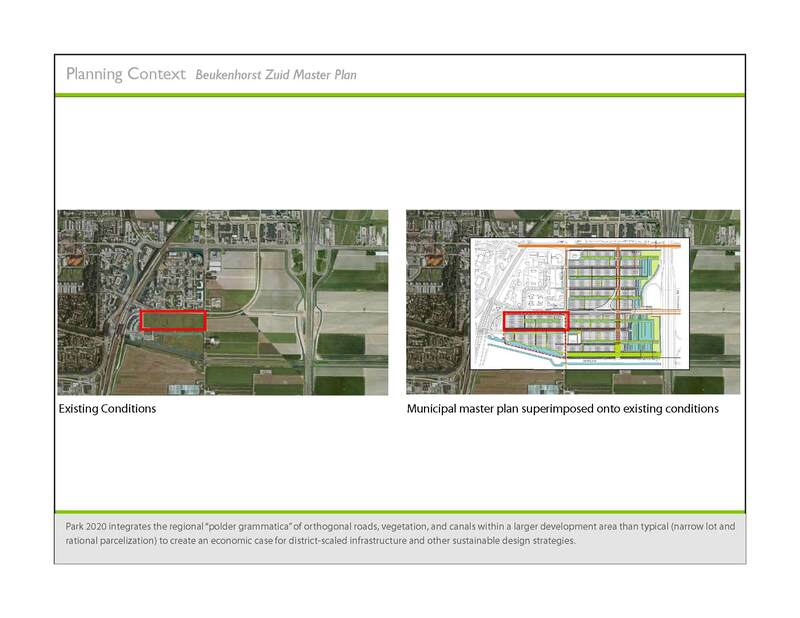 Park 20/20 master plan received unanimous approval by the City Council of Beukenhorst in June 2009. Site and architectural design of Phase I (two buildings) commenced in Fall 2009 and is utilizing C2C protocol for material specification. Construction on the first building will begin in March 2010. Park 20/20 is being developed by a private development company. Regional and national government entities are involved in economic development aspects as it seen as a showcase of cradle to cradle design and a new benchmark for regional development. Both sustainability and cradle to cradle commitments are terms of the contract between the developer and the government.